The present St Oswald's Church adjoins The Grasmere Gingerbread Shop. It was established in the 14th century and is famous for its annual rushbearing ceremony. Hand-written on parchment, Sarah Nelson's original secret recipe for Grasmere Gingerbread is safely stored in a bank vault in Cumbria. The Grasmere Gingerbread Shop is situated in Church Cottage, former home of Sarah Nelson and her family and before that the village school built in 1630. Grasmere village is situated in a gentle valley in the heart of the beautiful English Lake District, surrounded by dramatic fells and picturesque scenery. Welcome to The Grasmere Gingerbread Shop which was established in 1854 during the influential and industrious Victorian era; a very different time, a very different world. The Grasmere Gingerbread Shop is the only place in the world where you can buy delicious Grasmere Gingerbread® either in person or here via our online shop. Grasmere Gingerbread - a spicy-sweet cross between a biscuit and a cake - is 'the best gingerbread in the world' according to one leading newspaper critic, and it is feted by leading chefs, royalty and celebrities. Sarah Nelson, a brilliant Victorian cook, invented Grasmere Gingerbread in 1854 and its reputation steadily grew through word-of-mouth testimonials as more and more people visited the Lake District. The dramatic Lake District fells of Helvellyn and Helm's Crag, with its 'Lion and the Lamb' rock formation, overlook Grasmere and attracted Victorian tourists eager to escape the hustle and bustle of the cities. Originally a village school built in 1630, Sarah Nelson's Church Cottage home (now The Grasmere Gingerbread Shop) enjoys an ambience of past times with original stone sills and charming nooks and crannies. Sarah Nelson lived and worked amongst the towering literary figures of the Victorian era which included the poets Samuel Taylor Coleridge and William Wordsworth who wrote the famous poem 'Daffodils'. The original distinctive blue and white logo for Grasmere Gingerbread reads 'None Genuine Without Trade Mark' and is still used today on Grasmere Gingerbread wrapping. Sarah Nelson was often outside Church Cottage, selling Grasmere Gingerbread and refreshments from a table top that sat on a tree stump. Sarah Nelson, who died in 1904 at the age of 88, is buried in St Oswald's churchyard, just a few yards from the grave of poet William Wordsworth. Romantic poet William Wordsworth, author of 'Daffodils' lived and worked in Grasmere and occasionally taught at the village school. Victorian tourists used the rapidly expanding railways and romantic steam trains to reach the Lake District and The Grasmere Gingerbread Shop in the 19th century. Cumberland and Westmorland Wrestling, which may have evolved from Norse wrestling brought to Britain by Viking invaders, is one of the highlights of the annual Grasmere Sports sponsored by The Grasmere Gingerbread Shop. Grasmere is a tranquil oasis; serene and beautiful throughout the ever-changing seasons. Nestling amidst the peaks and highs fells of the timeless Lake District, it is a jewel in the National park's crown. Gingerbread Shop is a true family business with roots stretching back to the Victorian era. Third generation owner Joanne Hunter says: "My great-great grandparents entertained William Wordsworth for tea and my grandfather looked after the fire in his home." Grasmere Gingerbread is popular with celebrity chefs, TV and Radio personalities and even Hollywood actors like Tom Cruise and Renee Zellwegger. A host of Coronation Street stars have made a pilgrimage to The Grasmere Gingerbread Shop. Grasmere village is one of the most unspoilt locations in the Lake District. It is an ideal starting point for stunning scenic walks around lakes and across fells. Joanne Hunter is a third generation owner of The Grasmere Gingerbread Shop whose great-grandparents entertained the Wordsworths for tea. She runs the business with husband Andrew and the couple have three children, Yasmine, Eden Rose and Eamont. Charity begins at home and The Grasmere Gingerbread Shop supports the conservation of local wildlife, the landscape and life-saving organisations by fund-raising for Cumbria Wildlife Trust, Nurture Lakeland and the Great North Air Ambulance. To buy Grasmere Gingerbread or any of our wonderful foodstuffs and gifts please visit The Grasmere Gingerbread Shop in person (open every day except Good Friday, Christmas Eve, Christmas Day and Boxing Day) or make your purchase here from our online shop. 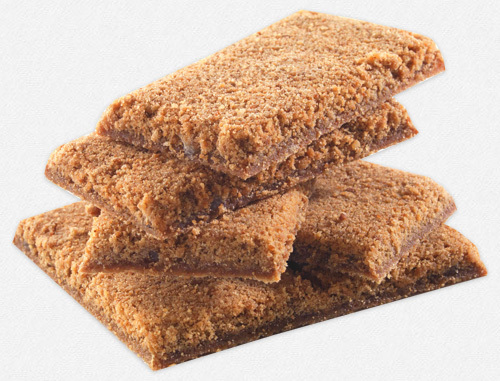 Grasmere Gingerbread® is available to buy in either six or twelve-piece packs. A spicy-sweet cross between a chewy biscuit and a cake, it is utterly unique, utterly moreish and one slice is never enough. Dozens of reputable suppliers, many of them Cumbrian, help to stock our online shop. These include own award-winning Cumberland Rum Butter and conserves to chocolates, natural skin care and body products and handmade gifts. Our award-winning Cumberland Rum is delicious - a delicacy whose exact origins are shrouded in mystery! It first appeared in West Cumbrian larders in the late 18th century after rum arrived into local ports via merchant ships. Rum Butter quickly became a mainstay of the humblest homes. Utterly unique, devilishly moreish and so mouth-watering one slice will never be enough; Grasmere Gingerbread is only available to buy inside The Grasmere Gingerbread Shop or here via our online shop. Grasmere Gingerbread® wedding favours are available in either heart-shaped or traditional pieces. Descended from historical 'bonbonnieres' - gift boxes given out at 18th century aristocratic weddings in Europe - ours are presented in a variety of pouches and boxes. Our fantastic hampers and gift boxes, packed with high-quality foodstuffs and, of course, Grasmere Gingerbread make stunning gifts. Choose from our selected range or create your own bespoke hamper with favourite ingredients from our online shop by calling us on: 015394 35428. Victorian cook Sarah Nelson invented Grasmere Gingerbread® in 1854 in the English Lake District village from where it gets its name. A unique, spicy-sweet cross between a biscuit and cake, its reputation quickly spread and it is now enjoyed by food lovers all over the world. Today, the business is run by third-generation owners Joanne and Andrew Hunter and every day visitors to the shop are greeted by the wonderful aroma of freshly baked Grasmere Gingerbread® hanging in the air. The Grasmere Gingerbread Shop also sells its own award-winning rum butter and a variety of ginger-themed foodstuffs, as well as toffee, fudges, chocolates, conserves, Cartmel Village Store Sticky Toffee Sauce, Kendal Mint Cake, conserves, ginger beer, ginger themed gifts, and much, much more.